Clubs can be a double edged sword -- sure, they may be filled with hot women and incredible DJs, but they also may be filled with Lindsay Lohan being all not hot, or worse...DJing. Thankfully pumping club sets to the safety of your computer: Dubset. Dynamic searching via DJ handles, a gig calendar, and genres, which span from drum & bass, to down-tempo, to "disco house", though given his leg issues the only part of the Hustle he can do is the clap. Streaming Player let's you build playlists of various DJ's sets side-by-side, difficult to pull of in real life as sharing the marquee can make DJs Tiest-y. Accompanying Info for every DJ, including a bio, upcoming gigs, an embedded Twitter feed, and contact info, so you can finally put in requests to Deep Dish whilst stuffing your face with some. 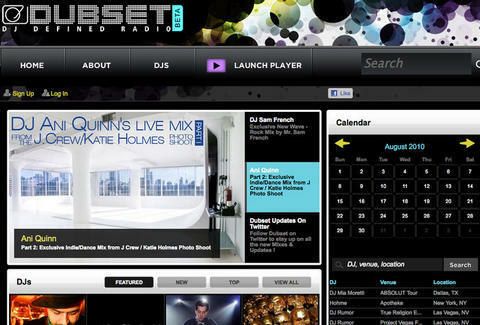 While still in beta, current offerings include Felix Da Housecat at LIV in Miami, a private job Mia Moretti did for a J. Crew photo shoot, and a "Holiday Party" at NYC's Webster Hall from Mark Ronson, whose sister Lindsay Lohan started dating when everyone stopped paying attention to her DJing.